Most of our sales over the years have been word-of-mouth, supplemented by the website information. 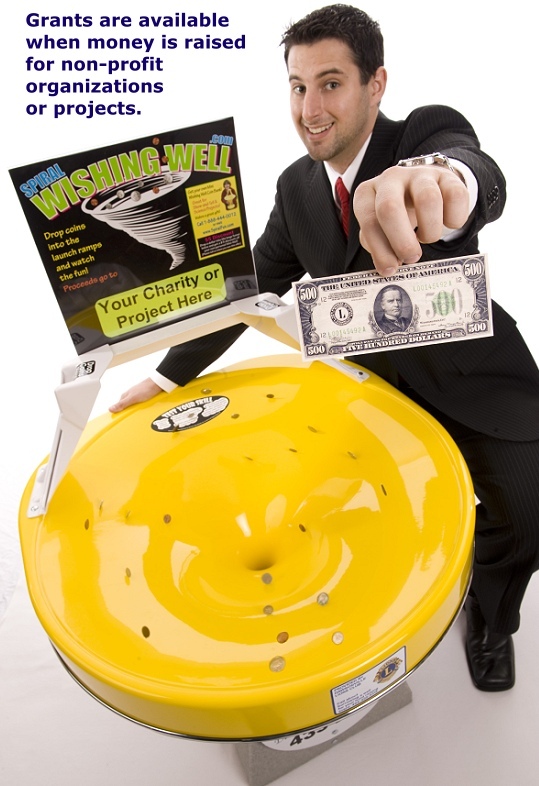 It is very typical for a museum, zoo, or library director, or a school principal, church pastor, or a Wal-Mart or McDonald's manager to call and say, "We have seen these wishing wells in other locations, and we want to know if we can get one too?" As a result, we have sold thousands of Wells to all corners of the world and to all types of locations that have raised over $1 Billion for non-profit organizations, churches, schools, service clubs, and other charities. Word-of-mouth sales is quite amazing. It is rather like someone calling and asking if they can send us money! Hmmmmm, let me think....YES, that would be OK with us!!! Each Well becomes a "demo" for the sale of another...providing ongoing sales for us, and now easy sales for local Reps with our new Rep Program. Word-of-mouth is very easy and has no marketing costs, but it is not very thorough. Even though there are thousands of Wells around the world, there are many cities that don't have any Wells in stores, restaurants, churches, schools, YMCA's, Humane Societies, bowling centers, theaters, museums, zoos, libraries, or any other locations. Along with this, the economy has devastated non-profit organizations, and so they are more eager than ever to find alternate ways to raise money. As a result, our business is flourishing, and we need help handling local demos and sales. With all this in mind, we have opened up our sales to local Reps who can do something we can't do from here: Carry a Well into a foot traffic location and leave it there for a couple of days so the store can see how easily it raises money, and how fun it is for their customers. After those two days, they won't let you remove it because they have seen it in action. It solves a fund-raising challenge for them by raising money the easy way WITHOUT soliciting their customers. 2) An ongoing profit from the toy mini-wells that sell as a result of the toy offer on the sign above the Well which basically says, "If you drop a dollar into the Well, you will get $5 off the purchase of your own personal mini-well.... Makes a great gift, and exciting show-and-tell...." In other words, every Well that is placed in foot traffic locations becomes a "demonstration device" or "silent salesman" that sells toys for you. It never gets tired, stands there 24 hours a day, and never complains!!! It just keeps on generating ongoing income for the Rep. You don't even have to handle the sales transactions! But you do have to deposit the money!!! 3) Rental income from renting Wells to churches, schools, and many other charities that conduct 1-day or weekend events such as the one that set the current one-day record of $40,979 at a church in California. We receive a lot of rental inquires, and we would love to be able to refer these to local Reps. Of course, rentals also lead to the easiest sales. In fact, some Reps only want to do this part of the program...get a Well...rent it 2 or 3 times per weekend, and pocket the split. The renting entity comes and picks it up, brings it back, and hands you the check for your share! And we will refer rental inquiries from your area to you. Reps are "Independent" which means that you would not be an employee. You would be self-employed with all the tax benefits thereof. There is no franchise or other license fee of any kind. You only need to purchase the Wells you rent and/or sell. If you want to sell Wells, you have to be brave enough to carry them into a store, library, or other foot-traffic venue, and say, "Watch this!" The Spiral Wishing Wells will do the rest of the talking! Reps can be full or part-time. Protected territories are available in the USA and Internationally. Lock up your territory today, and secure ongoing profit for years to come! If you are interested in becoming a Rep, send an email and request the "Rep Packet". I will quickly reply with a link to a password-protected page at no charge.